The Howlin’ Brothers are a three-piece string band originally from Ithaca, New York, now based in Nashville, Tennessee, and though they aren’t technically brothers, they do howl, growl, moan, and groan, and their mix of bluegrass, country, gospel, and blues is worth shouting about – they sing and play traditional classics and roots-inspired originals with passion and gusto! 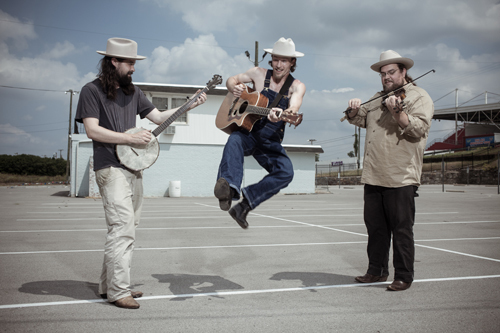 With Ben Plasse on upright bass, banjo, and vocals, Ian Craft on fiddle, banjo, and vocals, and Jared Green on guitar, harmonica, and vocals, the band has been howlin’ for nearly a decade now, and their fifth and latest album, Howl, has listeners all over the country pricking up their ears and paying close attention. Currently at #14 on the Americana charts, the new album is winning strong reviews. “Nothing short of fantastic,” the website earbuddy calls the song “Tell Me That You Love Me,” and praises the album as “about as forward thinking as any backwoods country record you’ll hear.” The website allmusic calls the band “loose and lively,” and “a compelling, muscled Americana outfit.” The Howlin’ Brothers are on the rise – catch them on the way up tonight at the Freight!